Or… the cure for what ails you. I came home from a lovely and long trip to Mexico with a nasty cold. Usually, at the first sign of a cold I make ginger tea, drink broth, and go to bed. On vacation I didn’t exactly stick to my regimen, but now I’m home and luckily had a jar of this turkey broth left in the freezer. I made about 4 pints of broth right after Thanksgiving (yes, I’m just finally posting this now). I decided to mix up my broth-making repertoire and asked advice on this stock from my colleague at the office, Andrew. We’d discussed our methods for making broth long ago, and I recalled that he roasts the bones. Little did I know that asking him would create a bottleneck of individuals in our office kitchen discussing best stock recipes. Between the lot of them, I got some good and new suggestions and I find myself completely in love with this stock. At Thanksgiving I kept the carcass (and some good leftovers) of 1 of the 12-pounders and I kept most of the bones just for this. Preheat the oven to 375. Break apart the carcass in any place that breaks easily. Place all bones in a roasting pan and roast for about 45 minutes to an hour. The bones should get a bit brown, but not blackened at all. While the bones are roasting, prepare the vegetables. Peel and clean the carrots and cut in half (same for parsnip if using). Cut the onion in half and remove the skin. Clean the celery and cut stalks in half. Leave garlic as is. If using leeks, cut them lengthwise and clean thoroughly. Add all vegetables to the roasting pan. Roast for another 15-20 minutes. Add about a cup of water to the roasting pan to deglaze (or wine if you have an open bottle) it: be sure to scrape up any brown bits. Now you have 2 options: you can add just enough water to cover the bones and continue cooking in the oven at 275, covered loosely with foil, or you can move the pan to the stovetop and then add the same amount of water. I moved it to the stovetop, too scared of spilling a pot of boiling water. Simmer over low-medium heat for about 2-2.5 additional hours, partially covered. Add a hefty pinch of salt and the parsley right when you add the water and then taste for more salt towards the end. When the soup is to your liking, remove from the heat and let stand, partially covered. When it’s cool enough to handle, strain the broth. Pick any leftover meat off the bones and save that to put in the soup or use however you like. Save or discard the vegetables (I nibble as I cook). Since there is very little fat in this method, it’s not necessary to skim. 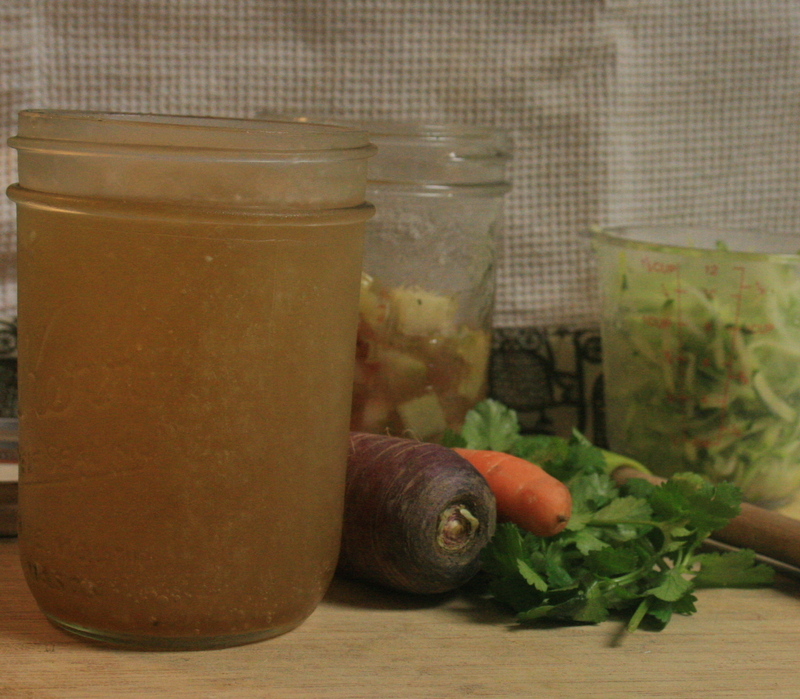 So once it’s cooled, place the broth directly into jars and freeze. This entry was posted in Dietary Restrictions, Recipes, Salty and tagged gluten free, lactose free, Leftovers, Meat, Parsnips, Soup. Bookmark the permalink. Great question Dahlia. I often freeze soup in jars. I do leave about an inch or 2 of space from the top for it to expand. Then I just label it and use it as needed. I don’t freeze the actual cooked meat in the jars though. I find that the texture of something like shredded turkey or chicken is just never the same. Excited to roast the bones for broth–still need to do that! Also, in ref to Dahlia’s question–I’ve frozen broth in glass and been both successful and unsuccessful. I think that head space is key!